From London restaurant revolutionaries, Russell Norman and Richard Beatty - the duo behind mouthwatering, small plates dining destinations - Polpo, Polpetto, Spuntino and Da Polpo - also came Mishkin's, their take on the Jewish American 'New York' Deli. After a cultural and stylish evening checking out the Valentino exhibition with my gorgeous girlfriend's L and S - we tottered over to Catherine Street, on the edge of Covent Garden to stock up on some much needed grub and vino. 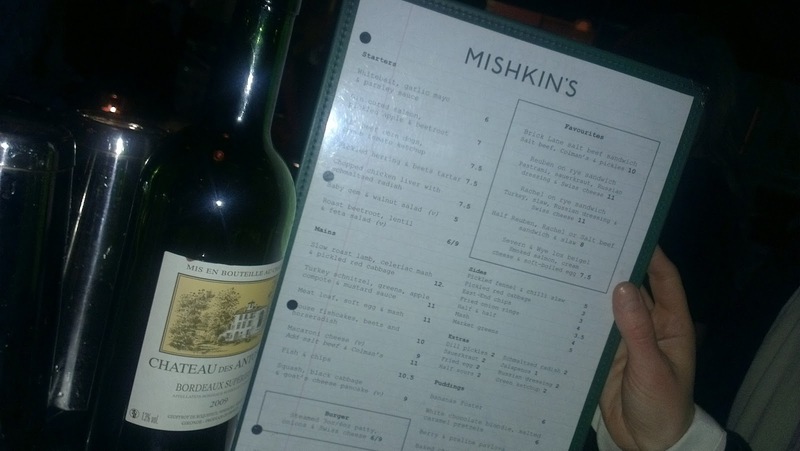 Much like its sister restaurants, Mishkin's faithfully evokes New York's Lower East Side through its interior. We perched at the bar with a comforting glass of red (it is pretty nippy in London still so this was just what the Doctor ordered) whilst we waited for our table. Promised just a 20 minute wait - we did actually stay 'perched' for a good 45 minutes...however, with much chat to swap, we didn't really notice. 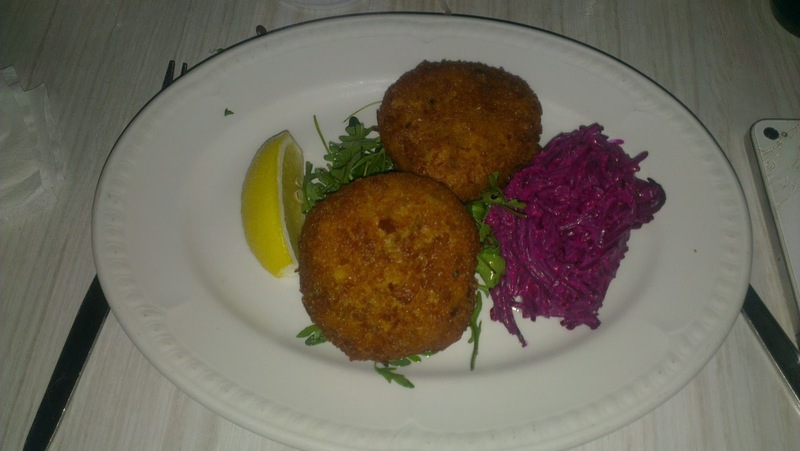 Taken to the back to a cosy table we settled in under the dim-light and devoured the menu and were certainly spoilt for choice with the traditional Jewish delicacies and dishes! We opted to share some starters - gin cured salmon, pickled apple and beetroot & roast beetroot, lentil and feta salad - with some schamaltzed radishes on the side (just because we were intrigued as to the 'schmaltzing' part - we've since discovered it's actually not the January dieter's friend but who cares!). The starters really didn't disappoint - the delicately flavoured salmon was mouthwatering... and the beetroot and feta salad has inspired, me, a beetroot sceptic to get involved and recreate this at home - because it was just the most perfect pairing. Definitely our two dishes of the evening - and worth a trip back for alone. Onto our second bottle of the Bordeaux, the mains arrived. 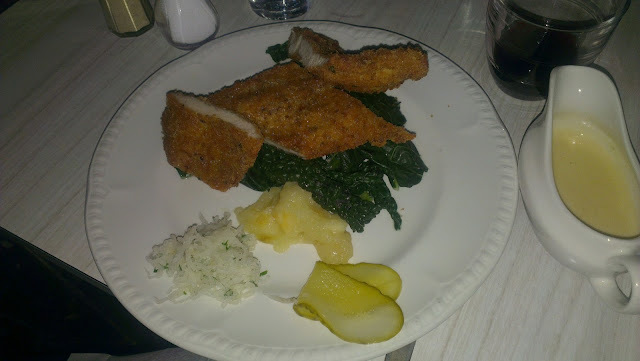 Lovely L went all traditional with the turkey schnitzel, greens, apple compote and mustard sauce (tender and comforting together) whilst S opted for the macaroni cheese presented beautifully in a copper frying pan, topped with breadcrumbs - it was perfectly creamy but, for a cheese freak like me, could have gone stronger on the fromage! I opted for the house fishcakes, beets and horseradish... these were perfectly formed patties full of fish and I (still a beets sceptic) dug into the beetroot and rocket on the side... perhaps a little dry - but no worries, as I quickly took a bit of L's mustard sauce that was definitely enough for two and complemented it well enough. 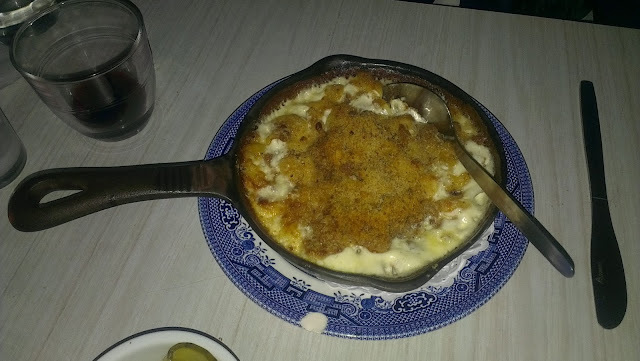 The service was a little slow - but it was actually quite refreshing not to be rushed out and have the waitress trying to fill our table with the next in line...even if we did end up home a little later than we'd planned on a Tuesday night! 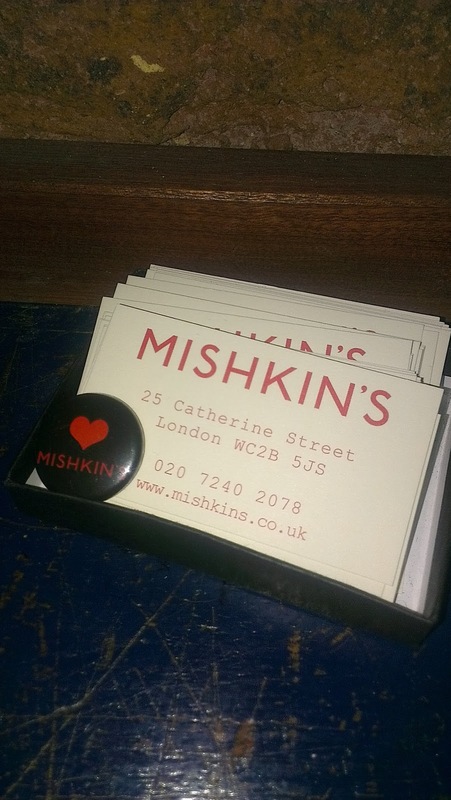 Now we aren't experts on Jewish cuisine so can't rate it against its peers - but it was a perfect little spot for a mid-week catch up and chinwag. 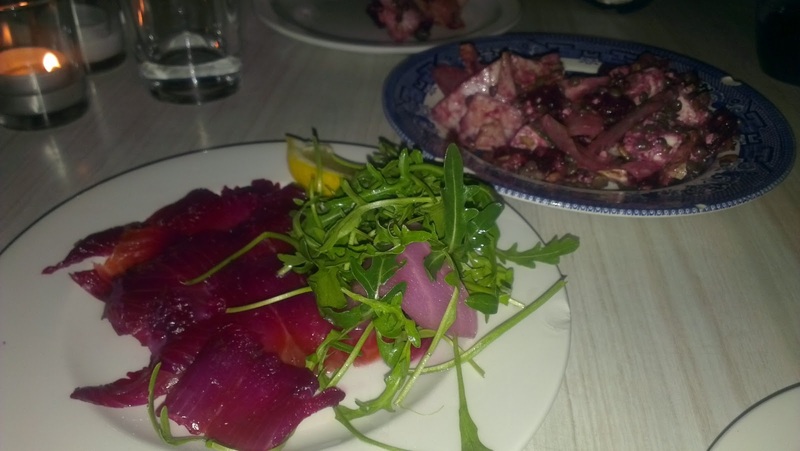 I think its sister's Polpo and Spuntino probably pip it to the post for a wide selection of to die for dishes that you can't stop ordering or eating... but we'll definitely be popping back in when we're in the neighbourhood!